How does the Messiah heal mankind by His own wounds? 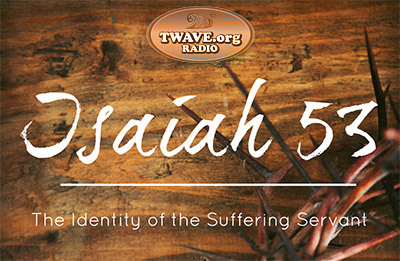 In this "The Truth Will Set You Free" TWave Radio episode, Pastor Vic Batista of Miami's Calvary Chapel Aventura and I will study the "Suffering Servant" prophecies found in Isaiah 53 that were fulfilled in the life of Jesus Christ. Vic Batista: Nathan, could you reread Isaiah 53:1-5 before you continue taking us through this passage, for those who are not familiar with the beginning of this prophetic story? "Who has believed our message and to whom has the arm of the Lord been revealed? He grew up before him like a tender shoot, and like a root out of dry ground. He had no beauty or majesty to attract us to him, nothing in his appearance that we should desire him. He was despised and rejected by mankind, a man of suffering, and familiar with pain. Like one from whom people hide their faces he was despised, and we held him in low esteem. Surely he took up our pain and bore our suffering, yet we considered him punished by God, stricken by him, and afflicted. But he was pierced for our transgressions, he was crushed for our iniquities; the punishment that brought us peace was on him, and by his wounds we are healed." Vic Batista: What a beautiful passage and what an encouragement! "By His wounds we were healed." We're healed not only from our sins, but from all sorts of depressions, vices and afflictions. When we come to Christ, He took our suffering on Himself for us. That's true love! Nathan Jones: What blows my mind whenever I read Isaiah 53 is that you've got to remember that this was written 700 years before Jesus came at His First Coming. 700! And yet, the chapter goes into great detail about how Jesus suffered and died for our sins. Jesus fulfilled these prophecies exactly 100%, rightly proving that Jesus Christ is the Messiah, the Savior, and the Son of God. Vic Batista: Then we have some groups out there that still don't believe that this passage is talking about an individual. Many Jewish people even today do not believe that this messianic passage is about a single man, right? Nathan Jones: They do try to spiritualize it away. In truth, the passage is kind of confusing when it refers to the Messiah as a tender shoot, or a root out of dry ground. It can get confusing. But, that description is imagery to point to the fact that Jesus came as a human, as a baby, and He grew up just like us. It's like if you want to understand how an ant thinks. As a human you couldn't do it. But, if you become an ant, you could talk to other ants. That is what God had to do. He sent His Son to become human. God took on flesh so that He could live and understand everything that a human experiences, and He could talk to us and interact with us so that we could understand Him. There is a lot about God that I don't understand, but with Jesus coming, we can understand God so much better because as a human we can finally relate to each other. Vic Batista: Nathan, that's a good point. By making that relation possible, it becomes a wonderful journey in which you never stop learning. There's now a wondrous relationship available between God and Man. I am so glad that I don't know everything. I am so glad that God is revealing His wonders every day. It gives me something to look forward to. Now when getting up every morning I say, "God, surprise me today!" Right, Nathan? Nathan Jones: Right, and you've got that word perfect — relationship. It's about relationship. Like you pointed out with all the other religions. Theirs is a distant, unknowing, uncaring god, or sometime no god at all, and you have to work your way into his good graces because he just might not let you into Paradise. But with Christianity, with the true God, Jehovah-God sent His own Son to reach out to us, and then sacrificed Him so the that punishment for our sins that weighs so heavily on us moved to Jesus Christ when we accept Him as Savior. Once purified by Christ's blood, then we can stand holy before God. He wants a relationship with us, but for that to happen, our sins had to be dealt with by Jesus' dying on the cross in our place. What love the Father has lavished upon us! Vic Batista: That is awesome! That is why we encourage everyone, that if they don't have a relationship with the Lord they can start that relationship today, even right now. Nathan, share with that person who doesn't have a relationship with Jesus, how they can start that relationship with Him. Nathan Jones: First, you have to understand that you are a sinner. Romans 3:23 reveals, "For all have sinned and fall short of the glory of God." In other words, we are not perfect; none of us are. We have rebelled against God, and so, we have to admit that we are sinners. Romans 6:23 says, "For the wages of sin is death, but the gift of God is eternal life in Christ Jesus our Lord." Because of our sins, we have been given the death sentence. Our rebellion against God has put us under an eternal punishment, which is Hell. But, the gift of God is Jesus Christ, who died on the cross for our sins. Romans 5:8 says, "But God demonstrates His own love for us in this while we were still sinners Christ died for us." Jesus died for us so that He could take away our sins. First John 3:5 says, "But you know that He appeared so that He might take away our sins and in Him there is no sin." Jesus is perfect. He was the perfect, sinless sacrifice. By Jesus dying in our place, we can put our faith and trust in Him and so no longer face that death sentence. To begin that personal relationship with Jesus Christ and be forgiven of your sins, pray from your heart something like, "Dear, Jesus, please forgive me of my sins and be my Savior." Jesus promises to take away both the punishment for the sins and the eternal death sentence that comes with it, and give us eternal life. Vic Batista: As I just shared in the last segment, I got to lead my old co-worker Sylvester to the Lord, and he prayed almost those exact words. The joy that comes to someone's heart and face, it is just amazing. What a privilege it is that we get to share this Good News with people! Nathan Jones: Vic, you are causing me to sin right now because I'm envious of you getting this opportunity to share the Gospel and seeing Sylvester come to the Lord. Those opportunities don't happen all the time. I'm a Web Minister, so I get to talk to people all over the world, but it is usually third-hand and of course people aren't always as personally interactive. I envy you pastors who are there day in and day out seeing people face to face, sharing the Gospel and seeing people come to the Lord. That is just awesome! Vic Batista: Any fruit goes to all of our accounts, because we know that these opportunities come by divine appointment. That is how God works, so that no person can get the credit. We can just rejoice. While most people don't have the opportunity to share the Gospel over TV and radio to reach the multitudes, they can over the Internet. Who knows, you might not find out for a year or so, or never even, if someone came to the Lord through your outreach, but you will know in eternity. Nathan Jones: I sure hope that our evangelistic efforts blesses someone. We had a woman named Cecelia from Uruguay, South America who wrote into the ministry. She was saying that a friend of hers had because of some materials that our ministry had produced helped her to accept Jesus Christ as Savior. So, we rejoice! We don't always know where we plant the Gospel seeds, but it is the Holy Spirit who waters them and makes them grow, bringing people to know Jesus Christ as their Savior. Fellow believers in Christ, your might be feeling down because you have been sharing the Gospel with someone and haven't seen any spiritual fruit. Well, you might not see the fruit now, but the Lord is planting it, and it might grow months or even years later, but it will grow. In the seventh part of our study of Isaiah 53 and the Suffering Servant, Vic and I will continue to look into the life of the Messiah as the Good Shepherd who is greatly misunderstood.